Brian Kunz donated a kidney to a friend in a live donor transplant. His story inspired us so much, we thought it worth sharing with all of you. No one understands the struggles, debates, and challenges of making this life altering decision better than someone who has done it. If you’d like to be put in contact with Brian, please send us an email at livingdonorlove@gmail.com. When I look back at my experience and try to reflect on whether I would recommend someone to donate a kidney, my first thoughts were to look at the initial process: what I went through in making this decision and ultimately being qualified or not. In reality, though, the process is what the process is. There are specific steps that people go through in a fairly methodical manner, and everyone has to go through it. On reflection, more important were the experiences after the initial procedure and how, if at all, my life has changed. A couple notes on the procedure and my hospital stay. Northwestern has a phenomenal program. My recipient and I went into the hospital on a Monday morning at 6am and things just flowed. By 2pm that day, I was in my room resting, post procedure. By 4pm the following day I was on my way home, somewhat sore but much more comfortable than I would have imagined. My recipient was home in time for dinner the next day. I was “off” work for two full weeks, although, as I was feeling well enough, I actually worked from home. By the third week I was back in the office part-time. I am not the best with my dietary habits and pretty much have gone back to my pre-op bad habits of eating just about anything. Northwestern has follow-up check-ins over the first two years, and so far all my “numbers” are in line. I do go for annual physicals on my own, and I always make sure my provider knows I am a donor, especially if he prescribes meds. I do this to ensure that I do not take anything that will have an adverse effect on my remaining kidney. Mentally/emotionally? I have no regrets and am solid with my decision. For my family and me this was a somewhat easy decision. First, I really like my recipient, who is my next-door neighbor. He is a great guy with a wonderful wife and two great children. As his family has some issues with this disease, he didn’t want any family members to be donors. Second, my family did not have any history of any type of kidney disease. 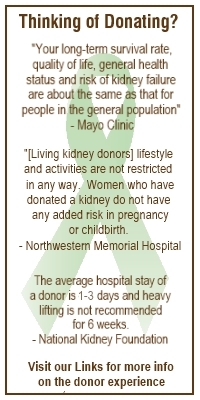 Northwestern goes beyond looking at just the kidney function; with my family’s general history, we viewed my donating a kidney as a limited risk. The experience has been truly rewarding. Every time I see my neighbor and how well he is doing, it puts a smile on my face. I am proud that I was able to help someone in a way that made a difference in so many lives: his family, their friends, my family, and our friends. I don’t know how to describe it, but I look at him differently now. He is no longer just a good neighbor; I view him as a family member. Sharing this experience with him and his family has brought both of our families closer together. Would I advise someone to do this? It has to be their choice. I can only provide my insight into the situation. Would I have done this for someone I didn’t know? Probably not, at least not initially. Would I now recommend someone doing it for someone in need? Yes, I would suggest at least considering it. For me, donating to someone who I knew was easy. Donating to someone you may not know may be a little more difficult of a decision, but in my opinion it would feel equally rewarding. Each person needs to make this decision – this life-long decision – based on what is best for them and their family. My wife, Lara, said that one of my first statements upon my coming out of surgery was, “I made the right decision. ” I still feel that way.